Red Dead Redemption let me pretend I was in a place that was once real. It nearly overwhelmed me with the deft manner in which its plain core gameplay was put in service of many unusual and interesting activities. Its characters weren't just memorable. Their behaviors were fascinating: the tension of romantic affection stifled into friendship; the stubborn clinging to past glories; etc. 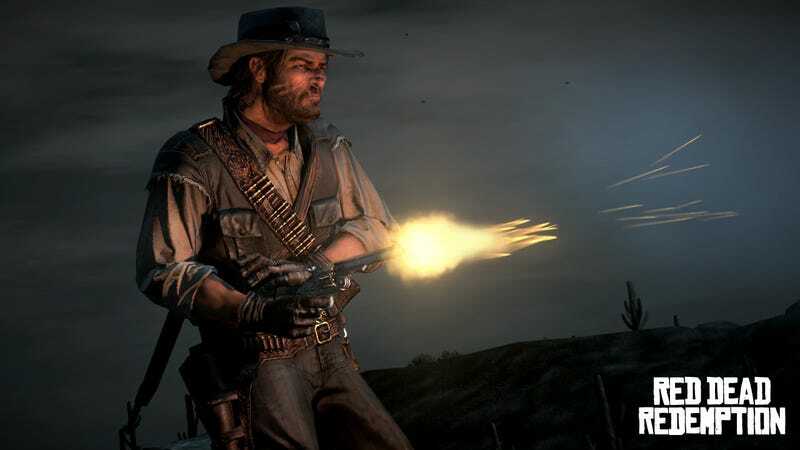 The game's developers at Rockstar created a work rich with the results of great decisions: they were right to trust its players to find its treasures by scrutinizing its landscape; right to interrupt the game's instrumental soundtrack occasionally with a stirring song; right to end John Marston's story not when expected but only after we got to see what could become of a weary outlaw who pined for a wife and son long unseen. There was no game in 2010 as beautiful and as full of such smartly-crafted adventures — loud and quiet, grand and quaint — as Red Dead Redemtpion. It was the best video game of 2010. We're so used to video games being derivative works of fiction that we almost take it for granted. We simply assume that because a game is basing itself on an established genre in another medium - in this case cinema's Westerns - that the world you're about to enter is going to be somehow lesser because of it. How great Red Dead Redemption is, then, to overcome this. Through its strong cast of characters, sharp dialogue, gorgeous visual design and skin-tight soundtrack, the game stands proudly in the company of any dusty plain crafted by Sergio Leone, John Ford, Sam Peckinpah or Clint Eastwood. Of course, as some will no doubt point out, it's far from perfect. It was buggy, Marston made too many idle threats (and went on one too many pointless errands), and its multiplayer was a good idea gone bad. But games shouldn't be judged like a science exam. We're not looking for perfection here. We're looking for the richest, most memorable and enjoyable experience of 2010, flaws be damned, and for me, that came from completing Red Dead Redemption. Twice. Yes, people talk too damn much (especially for a Western!) and, yes, John Marston sometimes comes across as everyone's errand boy, but this is truly a compelling game and truly a compelling Western. John Marston is a good man. Players have the option to make Marston do bad things, but I could never bring myself to, not for fear of in-game punishment, but because John Marston is a good man. I can't ever recall a game giving me so much freedom, and then deciding for myself to stay as close as possible to the straight and narrow, because that's what John Marston would do. So much of what makes a game click for you boils down to timing — when you play it. The stars were aligned, I guess, when I sat down with Red Dead Redemption. The setting, the mode, the story all clicked. I agree with Luke and Totilo. This is one special game and Game of The Year. It's extremely difficult to argue against you guys when it comes to Red Dead Redemption. When I previewed the game back in March of last year I knew Rockstar was creating something spectacular. That a video game could make an act as simple as sitting on your horse staring out across the scrub plains such a rich and satisfying experience is an astounding feat. This is a game that revitalized the love of the Old West I felt as a young boy, back before I played video games; back when toy guns were allowed to look like real guns. Red Dead Redemption brought those childhood memories to the surface, along with a bittersweet longing to live in a time long since passed. This is supposed to be a debate of sorts, but I agree with most everything Stephen, Luke, and Ash have said. Red Dead Redemption is a very strong contender for Game of the Year. I simply feel that another game deserves it a little bit more. Red Dead Redemption was a game I wanted not just to finish or to simply progress through, but to play. I wanted to spend time in its world, watch sunsets, ride beneath the stars and see what kind of trouble I could get John Marston into. I preferred its wide expanses to Grand Theft Auto's verticality. I liked that Marston could crack wise and make me laugh, that he could be believably exasperated with delaying, demeaning fetch quests. He channeled my own feelings masterfully. I'll concur with Mr. Plunkett on Red Dead's most obvious flaws and must take issue with the game being "fun to control when you wouldn't expect it to be." I found the shooting sometimes clumsy and the cattle herding a terrible diversion, particularly when there were stronger mechanics that could have been more fully explored. But I rarely remember its flaws when thinking fondly about Red Dead Redemption. I loved riding horse, hunting coyotes, feeling like a good person (even with a body count in the hundreds). It's my game of the year. Whether or not it's fair to discuss it here, the game's add-on episode, Undead Nightmare, was a wonderful way to expand this game. Its contribution to Red Dead Redemption only makes me enjoy the experience all the more. Red Dead Redemption's small-bore flaws may not be disqualifying, but it is not a perfect game in the bigger picture either. It shows its biggest shortcoming when it stumbles on the line between being an endless experience and an interminable one. Every optional job or pastime chips at the implied urgency of Marston's overall mission, and I was constantly warring between wandering to that question mark on the map or getting on with the game. I admire the game's ambition. Like every great western, it aspires to tell the last definitive story of the genre. Choosing 1911, a year not commonly associated with the old west, shows a storytelling nuance whose absence in other western action-adventure games have kept them from fulfilling their potential. I thought often of Butch Cassidy riding a bicycle, as stagecoaches rolled by utility poles. But the game I nominated came closer to fulfilling its outsized ambition more than any other game of the year, period. NBA 2K11 was no less than a mainstream phenomenon in the month of its release. It was the standard bearer of one of gaming's principal genres, and we'll still be talking about it in five years. Will we about Red Dead Redemption? Red Dead Redemption is a marvel. But it is a marvel in the way Rockstar has always excelled: Creating a living space. I'll give you the game's intelligent, witty, gripping dialog. I'm even willing to say that the characters, when they're not busy being tropes or acting as props for a bigger story, are compelling creations. But remove Rockstar's gorgeous back drop — its living landscape — and you're left with a game rife with the same issues with which the famed developer always seems to struggle. Why does John Marston feel at times that he moves on auto-pilot, circling into campfires and missing doors by an inch or two? Why is the solution for the wavering controls of the six-shooter to slow time down so much you have the ability to correct, re-correct and finally pull the trigger? Why, in creating such a wonderful place, a digital diorama of a dying west, does Rockstar then feel obligated to make me traverse it so very many times? And how can a story be powerful when it is so lost in its own experience? So much of the game builds up to the moment when Marston can finally reap the rewards of a just life, only to have those short moments feel empty and forced. Where Grand Theft Auto IV ended with a phone call that hinted at a world with serious, lasting repercussions, Red Dead Redemption ends with the sort of trite revenge fantasy best left to spaghetti westerns. Red Dead Redemption is a great experience waiting for some solid gameplay to happen. Luke knocked the multiplayer, Ashcraft joined him in complaining about John Marston's many errands and McWhertor is no fan of the cow-herding sections. Well, the multiplayer isn't essential, I liked the cow stuff, and if we're going to eliminate games that include tedious elements from Game of the Year contention we're going to be left with, what, Super Mario Galaxy 2, Bejeweled 3 and Super Meat Boy? Great games, but I prefer the majestic Red Dead. Crecente manages to offer the best praise for Red Dead Redemption of any of us. A "living landscape," indeed! I usually like my video games to be tightly-paced, but I'm voting in favor of Red Dead's slow drawl. Crecente, if traversing the map is getting dull, take a fast-travel wagon or — dare I mention this again — listen to a podcast. Fahey, I'll deal with you in another debate. Owen, I'm calling you in five years. The topic of our phone call: Red Dead Redemption. This is the second of four debates surrounding our final choice for 2010's game of the year. All four will run this week. The winner will be announced Monday.